With the S&P 500 up another 1.5% today and Facebook reporting yet another quarter of blow-out earning (Facebook stock is going to $250 soon and I remain ‘long, and I recommend people buy), why is America, its economy, and its companies so dominant, but also why is America stable, too? You have all these headlines of unrest, partisan division, government shutdowns, MAGA-hat-wearing high school kids getting threats of violence on Twitter, etc., yet corporate America, the stock market, and the geopolitical and economic American hegemony hums along nonchalantly. This question is answered to some degree in in an excellent Unz Review article The Mystery of American Power. At least since the Second World War, there has been a veritable cottage industry of books predicting America’s supposedly inevitable decline, due either to the myth of American “exceptionalism” or to imperial hubris. In actual fact, one is struck at how steadily America has maintained its global share of power. Despite their economic recovery in the postwar years, the decline of Western Europe and Japan has in fact proved a more fundamental tendency. Russia has only partially recovered from the collapse from the Soviet Union. After decolonization – the collapse of the overseas European empires – in fact virtually none of Third World has been able to organize themselves as influential actors (“Brazil is the country of the future and always will be,” De Gaulle is supposed to have said.) Only capitalist China, it seems, will have the organization, intelligence, and sheer size to decisively overtake the United States economically. Between 2009-2012, many reputable economists and forecasters published books arguing that the Great Recession would be the start of some new ‘paradigm shift’ in terms of lower asset prices, America ceding power to foreign nations, less greed, and more overall ‘sobriety’. None of those things happened. The Dow Jow Industrial Average peaked at 14,000 in 2007; now it’s at 23,000! America under Trump is more powerful and relevant than ever. The left in 2016 predicted Trump winning would hurt foreign relations and cause all sorts of diplomatic problems; a year later, nothing happened. Germany–United States relations, China–United States relations are still strong, and relations with China have actually strengthened under Trump. The very fact that rich, smart foreigners want to come to America to study, invest, and create companies despite the left’s insistence of how bad, ‘racist’, and evil America and Trump are, is further evidence of how divorced from reality the left’s narratives are. Trump has the power to force small countries to do what he wants, by threatening sanctions. America’s political power and leverage is the highest it has ever been. The main threats/risks to a nation are: political, militaristic, and economic. Which two large economies rank the lowest in terms of these threats? America and China. Although America has a lot of political division, the corporate/private sector runs parallel to the private one and has a lot of autonomy. This means dysfunction in Washington seldom spills over to Google, Facebook, and Amazon, which keep growing and making more money than ever even as Americans feel more divided and angrier than ever, and Washington shuts itself down under the weight of its ineptitude and partisanship. These huge, leading tech companies want less government, anyway. From a libertarian or an-cap perspective, an inept government is better than one that does ‘too good’ of a job governing. An inept government may have a lot of bad laws but not be competent, willing, or determined enough to enforce them. However, emerging markets and small economies, in general, have much more political risk, because the political sector is much more intertwined with the private one, but also politicians much more control and influence over the private sector, such as seizing private assets or the establishment of state-owned monopolies that threaten private competitors. America has not has a militaristic threat since the 40′s, and has not had a severe economic one since the 30′s (by many metrics such as GDP decline, bankruptcies, and unemployment, 1929 was way worse than 2008). Furthermore, due to growing influence from the private sector, elites, and also due to political inertia, partisan division in the House, and other factors, statesmen have less power than ever. Earlier presidents such as Wilson, FDR, Eisenhower, Truman, Lincoln, etc., wielded much more economic and political power than Trump can ever hope to have, as much as his critics try to paint him as a dictator. Saudi Arabia, as another example, has a lot of economic risk due to oil dependency, some militaristic risk, but much less political risk (due to not having elections, although there is the issue of succession). Brazil has no militaristic risk but a lot of economic and political risk. China, by having a single-party state, has little political risk. It has little economic risk despite all the predictions of doom and gloom about tariffs and trade wars, which have yet to come to fruition and likely won’t. Of course, one can argue that risk and stability are not the same thing; it’s possible for a country to appear politically stable but still have hidden risks of future instability. So, overall, a major factor for America’s dominance is ranking very low in these three risk categories, and having a very strong, competent private sector that is mostly insulated from the less competent public one. A second reason is, due to above factors, America is a magnet for the ‘best and brightest’ from all over the world. This means more innovation, more companies, and more economic growth, but at the cost of possible demographic change over the long-run. A high-IQ German, Indonesian, or Chinese person has much more to gain by moving to America and attending a top university and then working at a top tech company and making a lot of money, than staying put and and having less status, a lower standard of living, and a lower-paying job. The third reason, and possibly the most controversial and important, is the so-called ‘Ashkenazi dividend’. This is related to above, but the huge influx of high-IQ Jews from Russia and Germany in the first half of the 20th century, is a contributing factor for America’s post-2009 tech and finance boom, and why America since 2009 has pulled ahead economically from the rest of the world. The second and third generation descents of these immigrants founded hugely-important tech companies such as Google and Facebook, and made major strides and overhauls in other industries such as finance and entertainment. I would also add, high-IQ Middle Eastern immigrants, such as Iranians following the Revolution, Chinese immigrants, and so on, although there weren’t as many as Jewish immigrants. 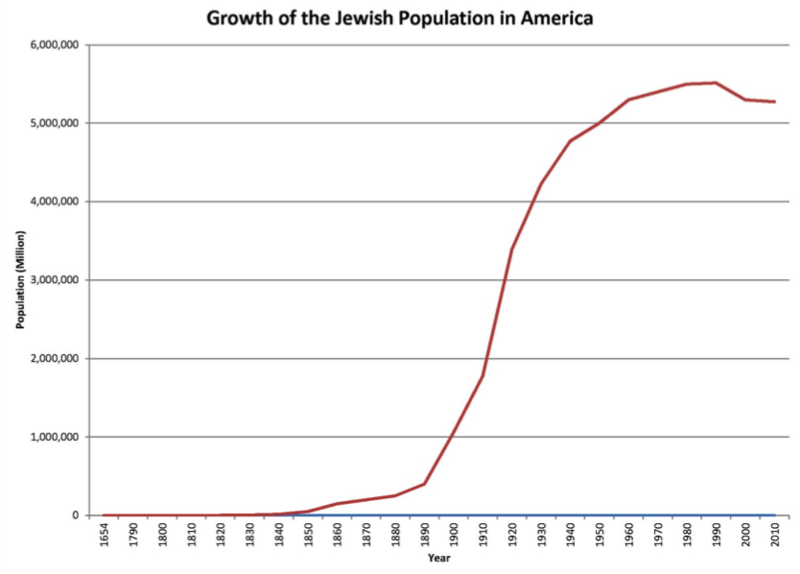 Jewish population growth in America exploded in 1880 through 1924 with close to two million Jews coming from Russia, Poland, Austria-Hungary and Romania. After their arrival at Castle Garden (and later Ellis Island), the immigrants often settled in some of the poorer neighborhoods of major cities and lived in conditions similar to the ghettos of Europe. These ghettos formed in New York, Philadelphia, Baltimore, Boston and Chicago. Since 2008, it’s not even close: America has pulled way ahead of France, UK, Italy, Spain, Germany, Canada, Brazil, Turkey, and Japan (and much the entire world, overall, except China and possibly Singapore and South Korea ) in terms of inflation-adjusted stock market gains and GDP growth. From the mid-20th century up until the turn of the millennium, White Christians were dominant in technology, but then starting in the early 2000′s, such dominance gave way to Jewish-founded start-ups such as Google and Facebook, and gentile-era tech companies such as Intel, Microsoft, Cisco, and IBM began to stagnate. This second tech resurgence starting in 2009 is a major reason of the economic and stock market out-performance of the U.S relative to Europe and much of the rest of the world. Major media companies such as CBS, as well as investment banks and payment processors , also staged enormous recoveries since 2009. Without this Ashkenazi dividend, it’s likely U.S. GDP and stock market growth would follow the rest of the world, which would make the S&P 500 about 40% lower than it is today (about 1,600 instead of 2,700) and the overall size of the U.S. economy about 17% smaller ($16t instead of $19.4t).